Sure, be all '80s and call these leg warmers. Or call them "leg corsets" or "boot uppers". They transform any shoes into fur-trimmed boots! They were fairly quick and easy to make, even though I hadn't worked with fur before. 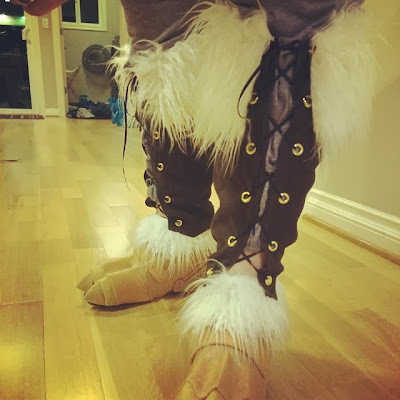 I made them for my Diablo 3 cosplay (currently in progress), but they are also very festive for the winter holidays! I may even wear them to a Seahawks game. 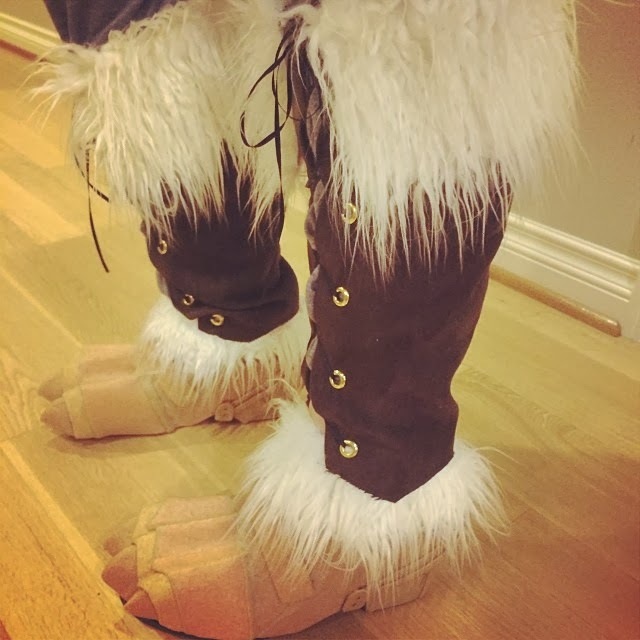 Here they are pictured with the clawed footwear (still in raw Worbla, not painted yet) that I am working on for the Barbarian costume. I'll include some construction notes here in case anyone is interested in making something similar. Disclaimer: I plan to reinforce these later, to make them less slouchy, perhaps using Buckram or boning. Start by creating a pattern of your leg. Cover your leg in plastic wrap, then masking tape, mark a line where the top and bottom edge should be, draw a line down the center front, then cut down the center front line and you've got your pattern. You can allow for the curve of the calf by snipping the pattern from the top down about 4 inches in two or three places to create darts. Cut the suede using your pattern. I serged the front and top edges - a roll hem would also work - and just cut the bottom edge since this fabric doesn't fray easily. When dealing with long fur, use a comb! Figure out which direction is "down" when you look at the fur and how it is laying. When you cut the fur you can try and slide your shears against the fabric to "part" the hairs, and that will give you less cropped short hairs at the bottom. The fur strips are 4" wide on top and 3" wide on the bottom. Start with a wider option because you can always trim it later. For the bottom fur, on my "boots" this is not attached, it is just like an anklet I slid on over my foot, and this works because there is a little bit of stretch to the fur fabric. I serged the top edge, left the bottom edge raw (it's hidden and fray-resistant) and sewed the two 3" end together to make a loop. After sewing the fur onto the suede, I added grommets. After marking the placements with chalk, I use a hole punch to make holes down both sides before I go get my hammer out and start pounding away. A regular hole punch is the right size to get a hole started for Large grommets. I know you posted this a while ago, but..
another good way to cut pieces out of fur and not damage it's, well, fur, is to trace your piece out on the back then cut it with a razor blade, cutting just through the backing.